I can't say that I have ever suffered from any kind of "infestation" before. Once, when I was in college, I did have a short-term hippy infestation but that issue resolved itself once I ran out of food and we were all forced to venture out into the wild and forage for chicken McNuggets. My current apartment is riddled with the demon spawn known to many as "cats". What disturbs me is that if I had a rat infestation I could poison them, guillotine them, smash them with a boot, gas them or chemically neuter them. Why can't I just use one of these methods with all these mangy, disease ridden cats? Oh right, cats are peoples' pets. So are rats or mice. Rats/mice also help cure diseases in medical studies. If you ask me, rats are awesome and seem to being pulling their weight. Cats, on the other hand, are lazy pieces of crap, they don't cure diseases, they only spread them and they probably killed the dinosaurs...probably. Have I mentioned I hate cats? I went on a run tonight and one of "Satan's minions" jumped a fence and started chasing me. This cat was missing half of its fur and probably had rabies (zombie virus). Am I blowing this out of proportion? Probably. Should I be prepared for the "Zombie Cat Apocalypse"? Definitely. This cat epidemic has gone too far. Someone is going to get hurt. It's us or them. 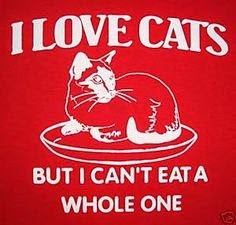 It's a cat eat cat world. Every cat has it's day. These cats are running out of lives. All cats go to hell. These cats are a devils best friend. Give a cat a pitchfork. Could I come up with more terrible dog/cat puns? Yes. Will I? No. Why? Because you managed to read this far and I feel like we are friends now and friends don't torture friends with awful puns. In the meantime someone needs to invent a "Cat-Away Spray". Oh wait that already exists. It's called Holy Water.